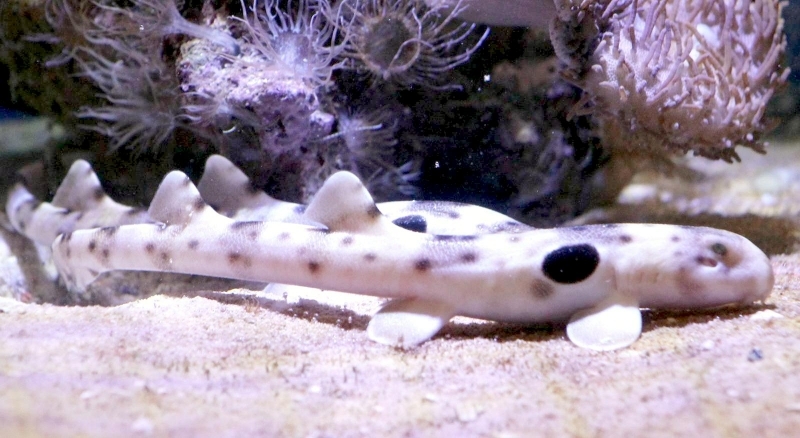 Named for the conspicuous dark patch on each ‘shoulder’ which are reminiscent of military epaulettes, the diminutive and prettily-patterned Epaulette Shark is as appealing as it is unusual. 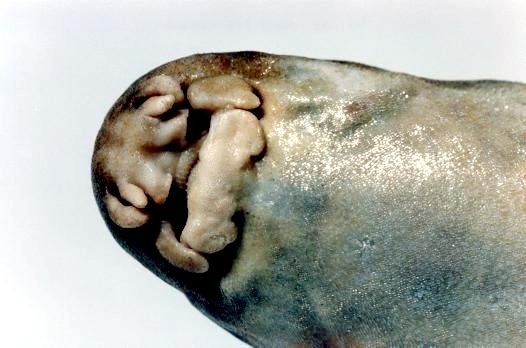 This species features an elongate, eel-like body with small, flexible posterior fins and highly mobile paired fins. 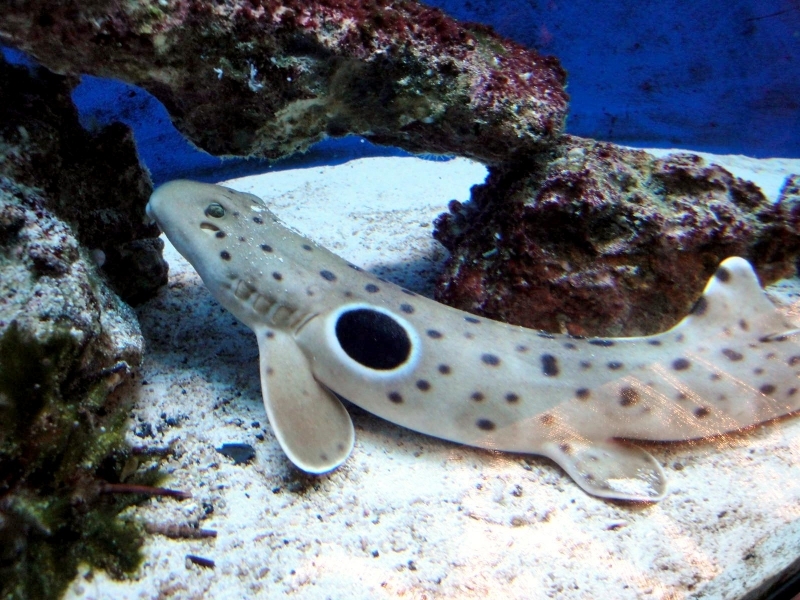 The paired pectoral & pelvic fins of Epaulette Sharks are broadly rounded and paddle-like. 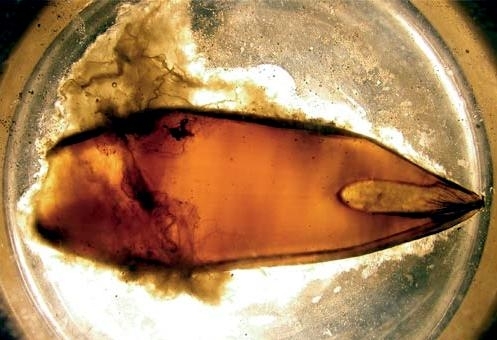 The internal skeleton of these paired fins and their attachment to the body has been modified, granting them a dramatically increased range of motion — they can actually be rotated almost 360 degrees. 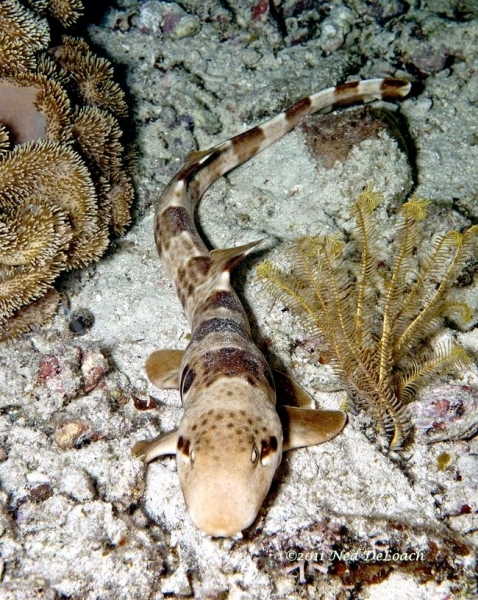 Epaulette Sharks combine side-to-side wriggling with coordinated pectoral & pelvic fin movements, enabling them clamber over complex rocky & coral substrates. 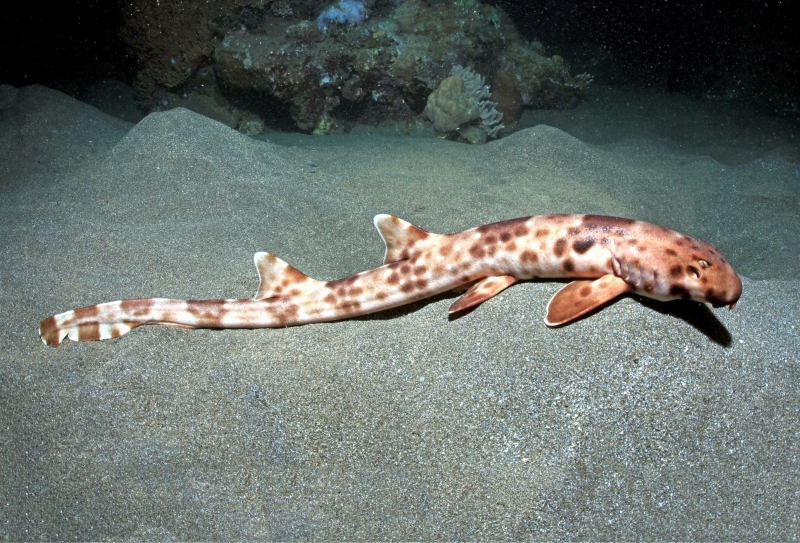 The wriggling gait of the Epaulette Shark has been studied as a model of the probable limb movements used by the first tetrapods (four-footed vertebrates) to clamber from the sea onto land. This research provides evidence supporting the evolutionary theory that the paired limb movements necessary for terrestrial locomotion predate the first amphibians. 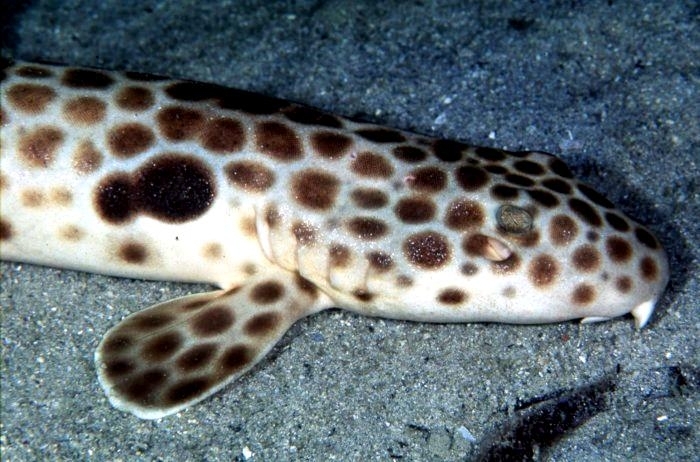 No matter how important it may be from a theoretical standpoint, the ‘walking’ motion employed by Epaulette Sharks is endearingly clumsy, resembling that of an elongate salamander with ping-pong paddles for feet. 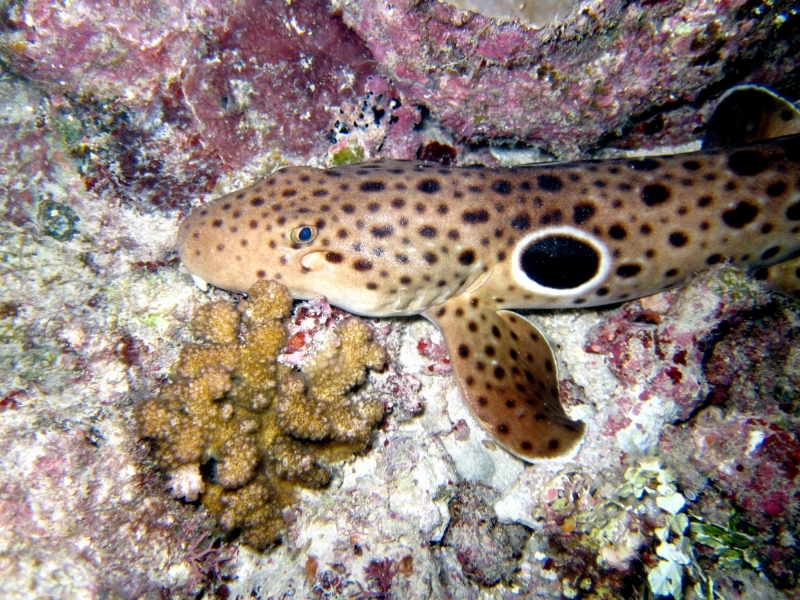 The elongated body and ambulatory talents of Epaulette Sharks enable them to crawl through the cramped, meandering passageways within coral reefs. 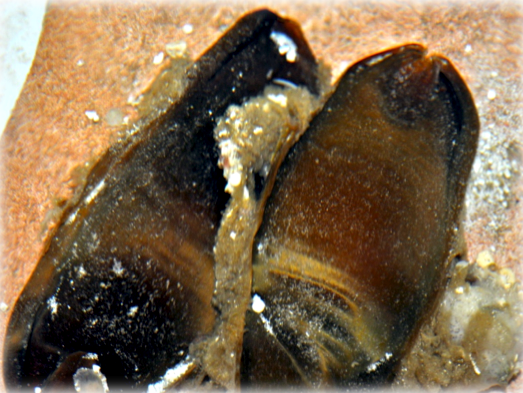 The shallow pools exposed by each low tide often offer rich feeding on the small animals trapped within, but are so extremely oxygen poor that few aquatic predators can exploit them. 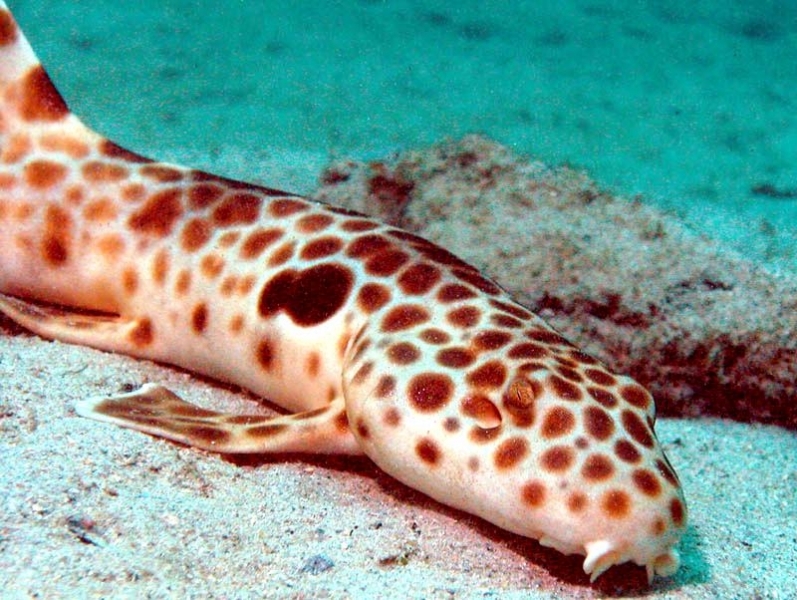 Recent research has revealed that under extremely low-oxygen conditions, Epaulette Sharks maintain blood flow to the brain by selectively dilating the blood vessels leading to it. 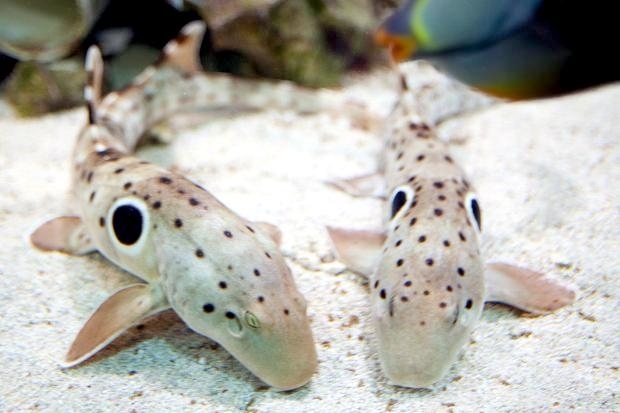 This simple mechanism enables Epaulette Sharks to ‘walk’ for hours at a time among exposed tide-pools and to make do with what little dissolved oxygen these warm little puddles provide. 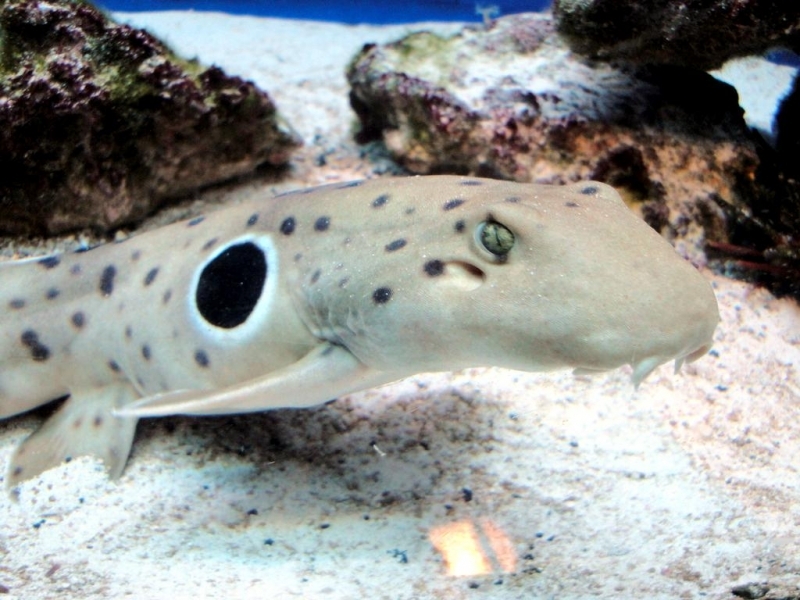 In addition, Epaulette Sharks’ nerves are adapted to function under low-oxygen conditions for prolonged periods. 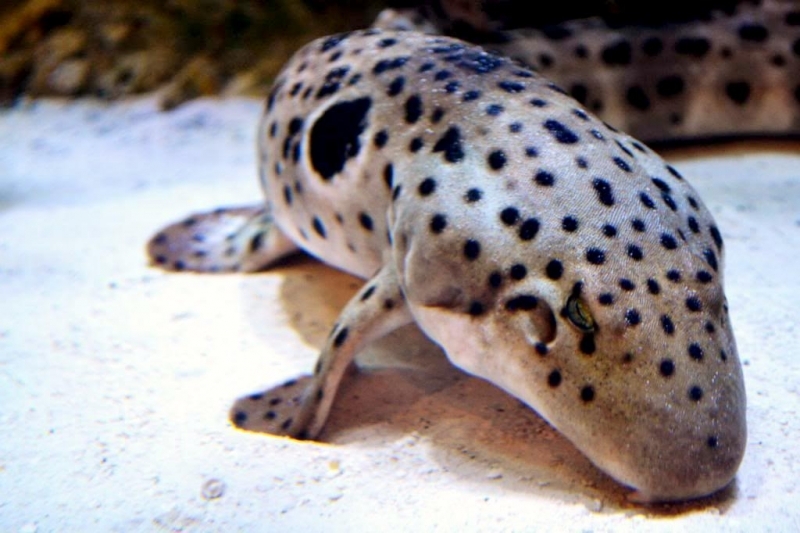 Their ability to compensate for hypoxic conditions enables Epaulette Sharks to feed in exposed reef flats & tide-pools during low tide. 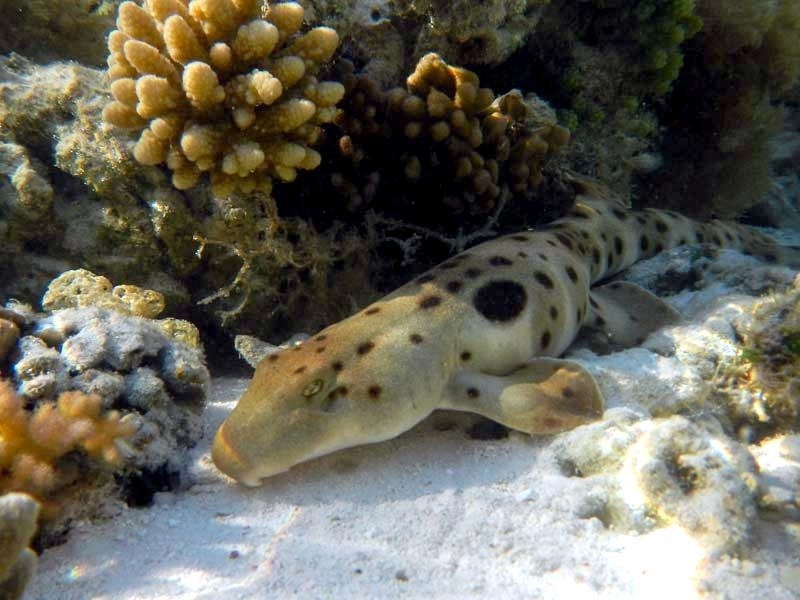 The diet and feeding behavior of Epaulette Sharks was recently studied on the shallow reef flats off Heron Island, Australia. 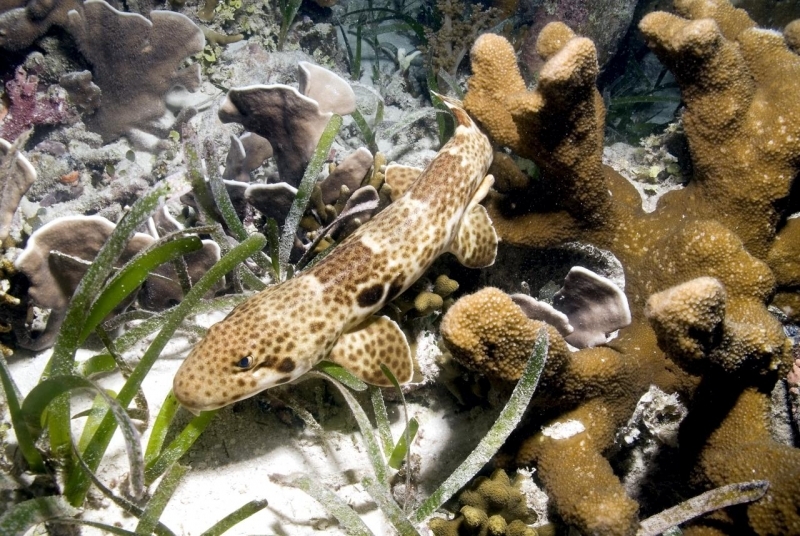 The researchers found that over 90% of Epaulette Sharks’ diet consists of just 2 prey types: crustaceans & segmented worms. 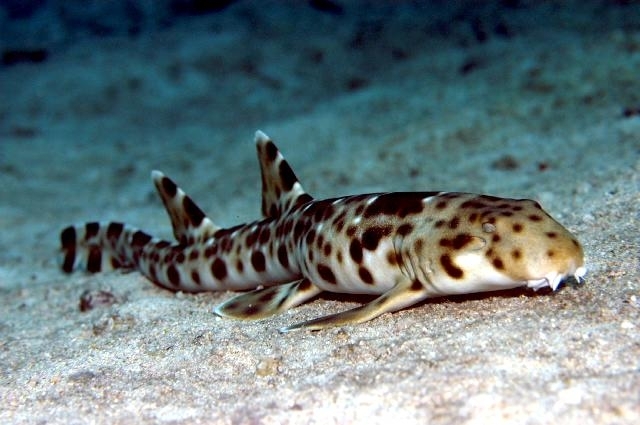 They also found that immature Epaulette Sharks concentrate on different prey types than mature ones. 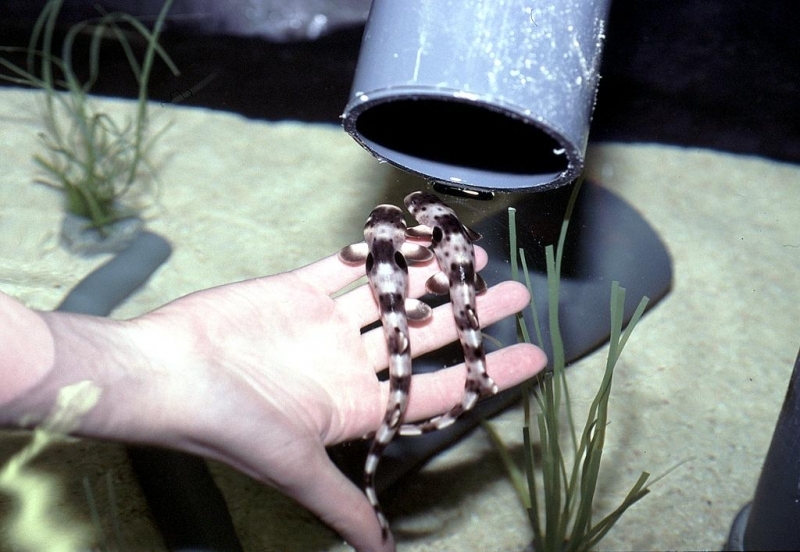 Juvenile Epaulette Sharks feed predominantly on polychaete worms, while adults feed predominantly on crabs. 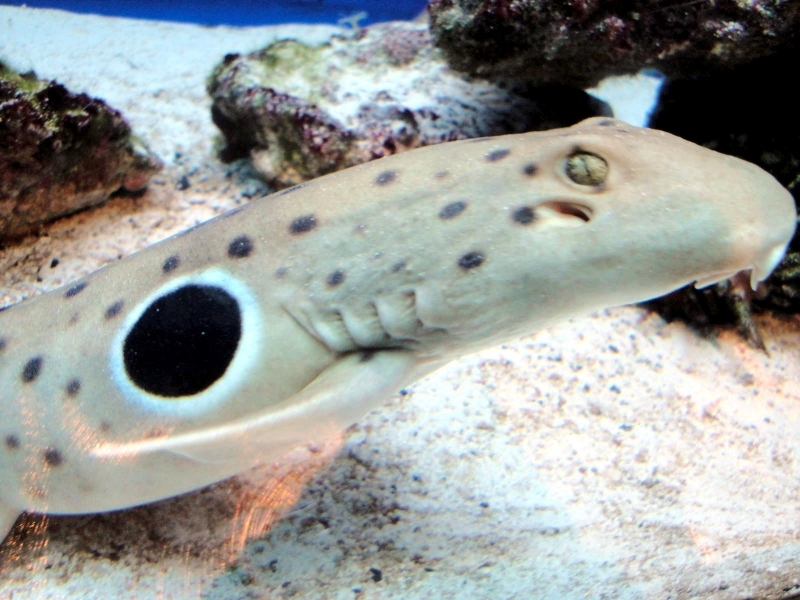 Round-the-clock observations indicate that Epaulette Sharks may feed at any time during day or night, but do so mostly at dawn and dusk. 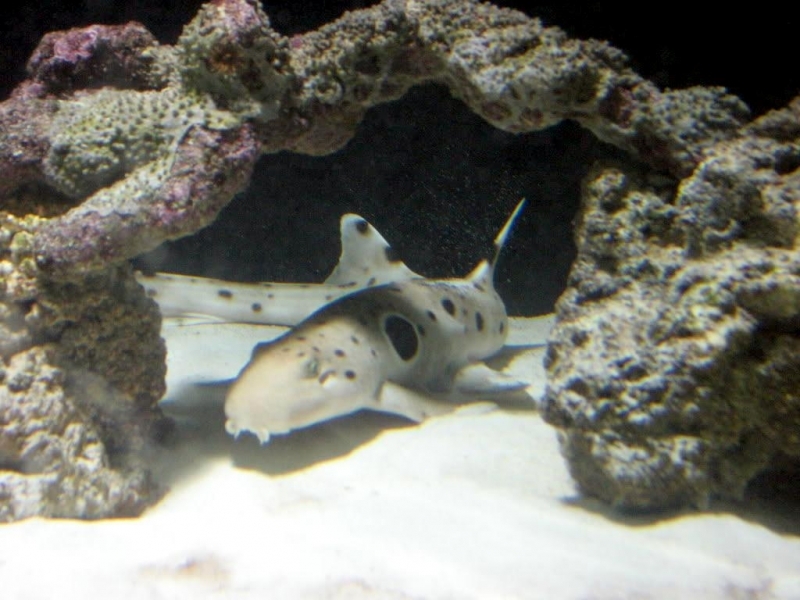 From this and other observations on Epaulette Shark feeding behavior, the researchers concluded that this species is opportunistic (feeding on whatever it happens to find), relying mostly on scent & electroreception to locate prey. 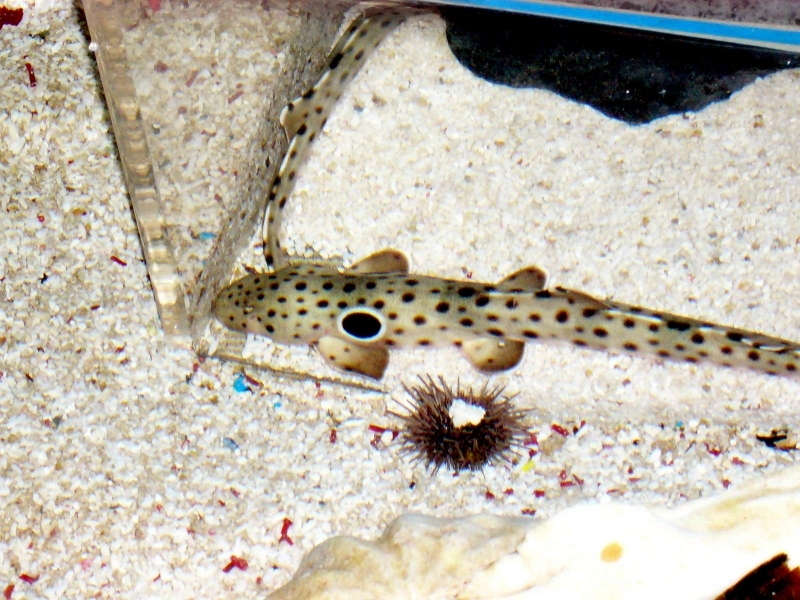 The shallow-water feeding behavior of Epaulette Sharks is absolutely delightful to watch. 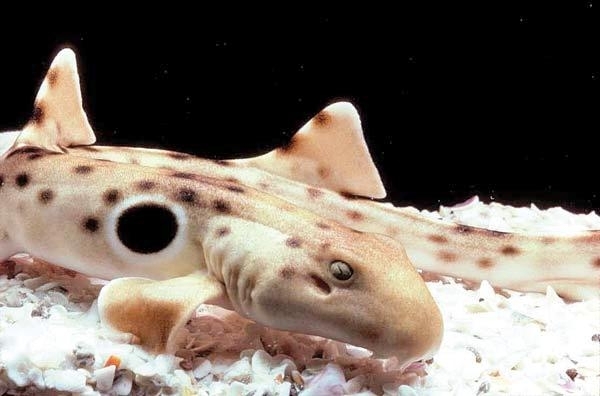 Clambering awkwardly over the substrate in its adorably salamander-like way, the Epaulette Shark uses is short snout to snuffle through sandy patches rather like a determined pig searching for truffles. 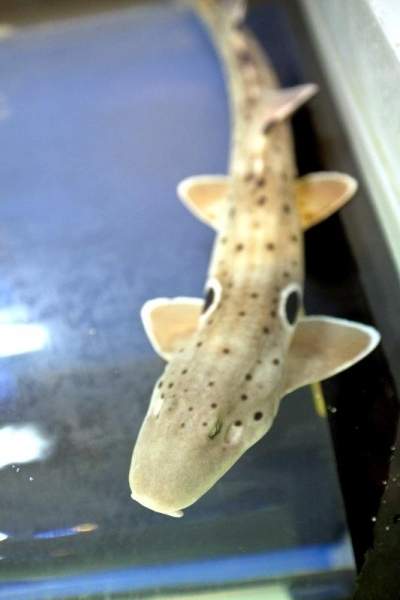 Epaulette Sharks often adopt a peculiar stance while foraging over soft substrates: the body is elevated on the paddle-like pectoral & pelvic fins while the back is arched and the ‘neck’ bent down resembling a selachian form of “push ups”. 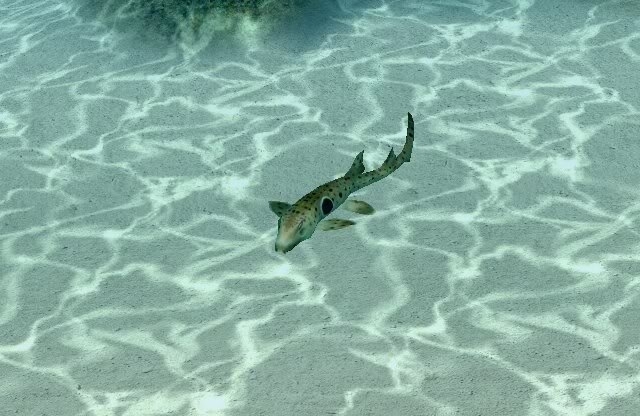 Stopping occasionally, the shark pushes its head into the sand and excavates buried prey through a powerful suction affected through coordinated action of its puckered mouth & thick gill musculature. 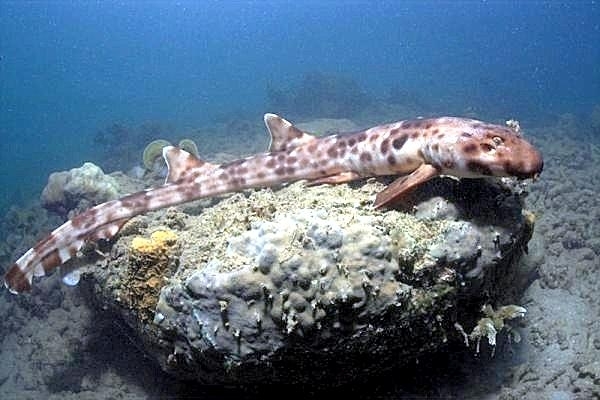 Sometimes, a foraging Epaulette Shark will flip over bottom debris with its snout, exposing hidden worms & crustaceans which are then quickly snarfed up. 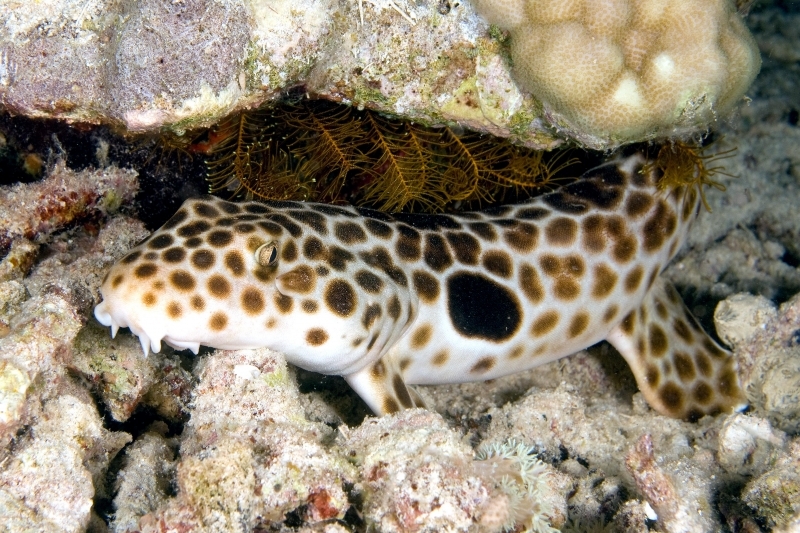 One naturalist reported seeing an Epaulette Shark wedge the anterior part of its body into a coral crevice, turn itself over and hoover up a small shrimp from the roof of the crevice. 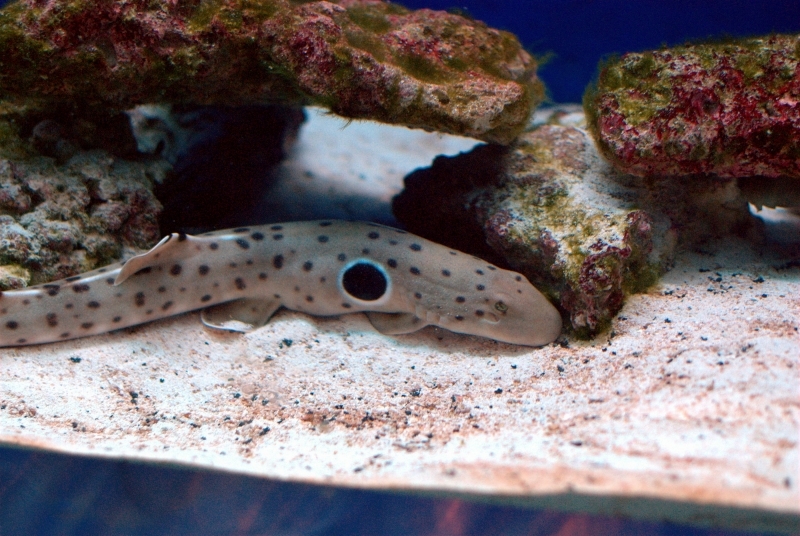 Apparently, the elongate Epaulette Shark occupies a niche more like that of Moray Eels than does any other shark. 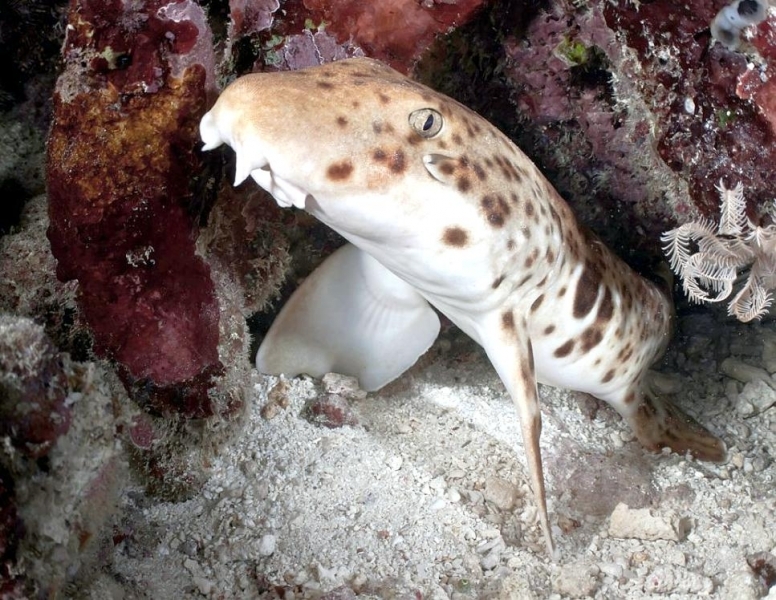 The Epaulette Shark is also unusual in that it often chews its food before swallowing, sometimes for as long as 5 or even 10 minutes. If the food item is relatively large, it often protrudes from the shark’s mouth, migrating from side-to-side like the stogie of an archetypal big-time Hollywood producer. 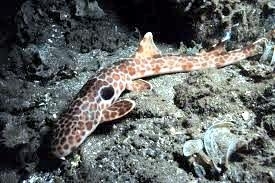 Clambering into exposed tide-pools creates exceptional feeding opportunities for Epaulette Sharks. Most notably, it adds to the menu ‘exotic’ fishes, trapped by the receding tide in confined spaces from which there is no escape. Any small crabs, worms, fishes or other creatures trapped inside a tidal puddle need merely be cornered against a wall of the pool and they can be captured easily. 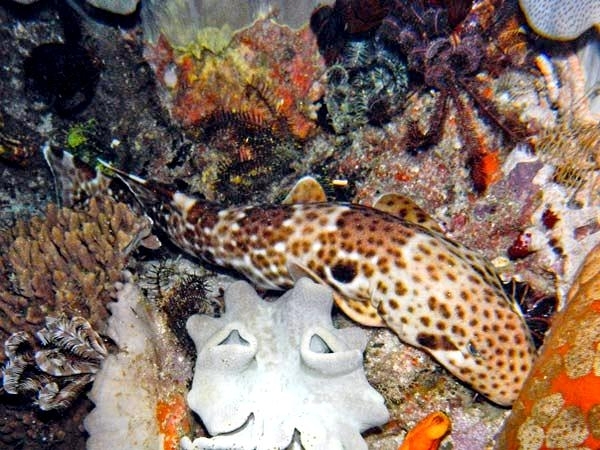 Unfortunately for the Epaulette Shark whenever there is easy feeding in nature, invariably others will come to exploit it too. 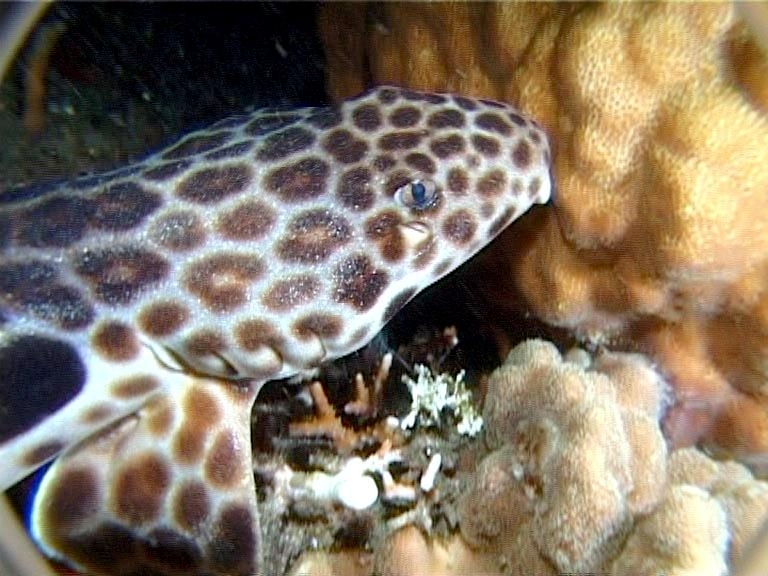 Every once in a while, a Moray or Snake Eel wriggles its way into a tide-pool and begins to feed on the bounty of small creatures trapped there. 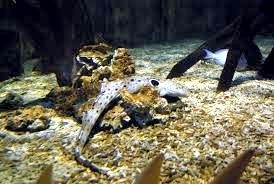 But what happens when one of these eels and an eel-like Epaulette Shark wind up hunting in the confined quarters of the same pool? Usually, one or the other competitor will simply move to another tide-pool. 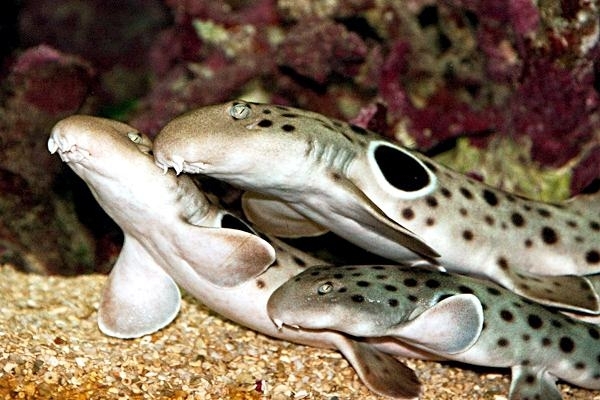 On occasions a fight breaks out, the shark and the eel biting while wrapping around one another as they writhe like angry snakes. 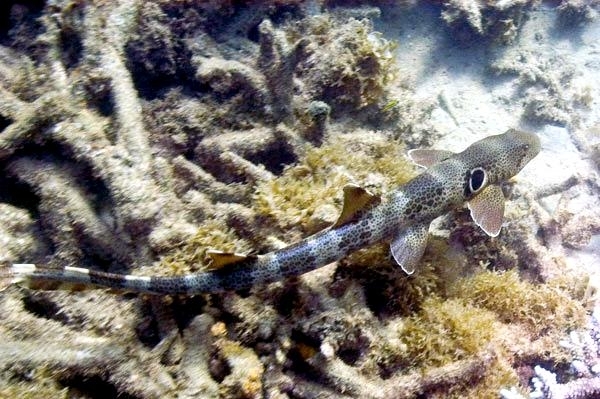 More often than not, the little Epaulette Shark concedes victory and clambers away as quickly as its paddle-like fins will carry it. 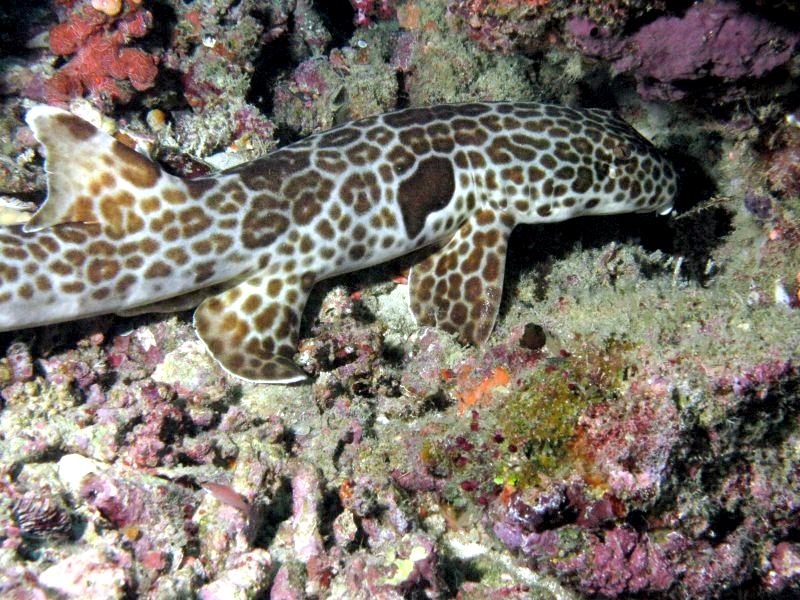 The shallow-water & inter-tidal meanderings of Epaulette Sharks also bring them into contact with people. 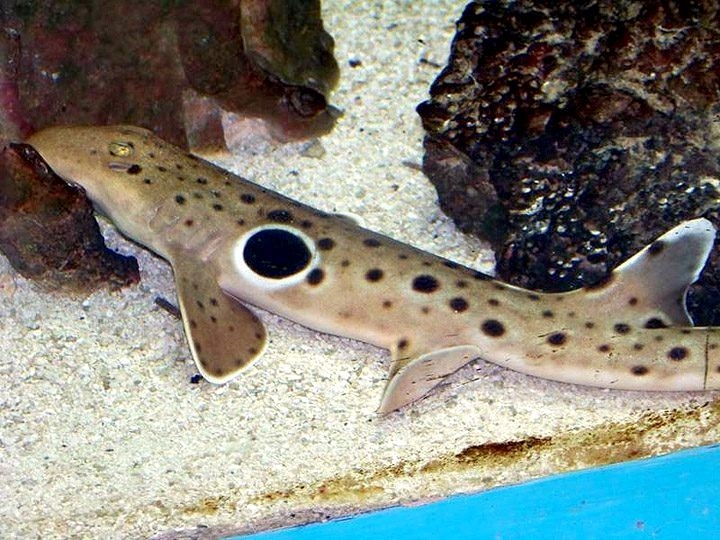 Due to their small size and endearingly clumsy locomotion, Epaulette Sharks are pathetically easy for beach-goers to catch. Captured individuals squirm vigorously, usually eliciting laughter & delight from human on-lookers. 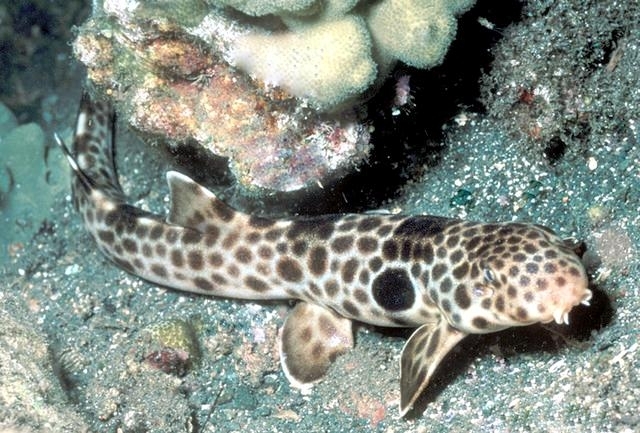 Although they cannot inflict serious damage on their tormentors, Epaulette Sharks are often injured in the ordeal. As is far too often the case with our interactions with wildlife, these encounters often provide human amusement to the detriment of the sharks.